Many dogs suffer from food allergies. 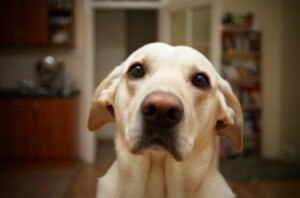 This is a guide about feeding a dog with food allergies. My dog Dazee has problems with allergies that cause her to chew, lose hair, and get sick. After treating her with cortisone shots, not only was it becoming expensive to visit the vet, she refused to eat the expensive foods we bought. Then this past January, she was in really bad shape. I had recently started eating yogurt a lot and it was helping me with my digestive system. I thought, well, I will try yogurt on her food. She not only loved it and refuses to eat her food without it, but within a week she started chewing less and growing her hair back. She started getting her energy back as well. Within a month, all her hair had grown back, she gained weight, and she was as spunky as when she was a puppy. So if any of you are at your wits end with trying to help your dog with the allergies or digestive problems, give yogurt a try. I use organic, plain yogurt. It's a lot cheaper than trips to the vet. Here is a picture of what she looked like when we first started the yogurt treatment. It broke my heart when I couldn't help her. Thank God for yogurt! Hi, my dog had a similar problem. I gave her some cortisol tablets, stopped her old food. Now she has a hypoallergenic food, James well-beloved, not sure if you can get in the U.S, as I live in the U.K, but I'm sure you can find similar, now I give her a few cortisol tablets in the summer and she's completely fine. Not sure about yogurt as my vet said she could be allergic to dairy, certain proteins, and flour. Hope that helps. Phoebe, one of my Yorkies was diagnosed with allergies too. She was very itchy, at one point her whole back half was bald, reddish and itchy. She used to chew herself constantly and had hot spots. She was on Atopica pills and a special diet, but did not have much improvement. Finally, the vet tested her for low thyroid, even though a symptom of that is weight gain or loss, and her weight stayed the same. Yogurt is so beneficial to the pets. Our dog was showing his allergies in the way diarrhea. His immune system will never be up to snuff as he was inbred. The yogurt keeps him doing great. It became expensive to buy the organic yogurt by the big tub. So I learned how to make it. It is easy and he loves it. Now, my hubby makes it. The hardest part is heating up the milk slowly, (which is not hard at all). I put the burner on number 4 on my electric stove setting (so medium low) and it takes about 2 hours for the gallon of milk to heat to 180. Then temper one cup of hot milk with one cup of organic plain yogurt. (mix one cup hot milk & one cup cold yogurt) then add all the hot milk, stir gently to blend it all. PS if you want to add flavors do it after it has formed into yogurt. Per cup add 1/8 of tsp of vanilla, you can add fresh sliced fruit, or a tsp of preserves, etc... Use it in your cooking. I sub the yogurt for buttermilk. or sour cream in certain recipes. It is a beautiful thing. If you are looking for a good quality grain free dog food, Taste of the Wild is a respected and trustworthy brand. Sometimes the best deals can be found online. This is a great deal for a 30lb bag of high quality dog food. What is a safe alternative to dry special diet foods like Science Diet, if your puppy (now 6 months old) seems to be having allergies to it? He seems to be always chewing at his under belly and inner thighs. Thanks. This is my first small breed puppy and we want him to live a long and healthy life with us. Our grandsons love him to pieces. For tens of thousands of years, dogs ate the same foods their owners ate. Dry dog food wasn't invented until 1860 (just 140 years ago), but through clever marketing, many people now believe you should only feed your dogs commercial dog food. My dog used to scratch and chew herself raw. This is what helps. Throw chicken in a pot boil it up. When cooked, pull the meat off the bones chop it up and add 2 cups of brown rice. If you want you can throw in some cooked peas or carrots (both). Theres nothing wrong with feeding your dog "people" food, they think they're people, don'they. Natural Balance is one of the best dog foods on the market, way better than science diet. And most of their selection is Limited Ingredient Formulated. I use to work at a pet store and switched tons of people to this food who were buying prescription diet foods and it was not only cheaper for them but their dogs did better on it then the prescription brand. **A secret to saving a buck too is go to a pet supplies plus or a tractor supplies plus they sell this brand for pretty cheap take a photo of the price sign then go to a Petco. They will not only price match it for the cheaper price but if you buy 10 bags in 12 months they mail you a coupon for a free bag. My Parson Russell started "chewing and licking her feet" so I took her to the vet. We did the allergy test and she is allergic to beef, salmon, corn, oats, and duck. +/- to: venison, milk, soybean, lamb, and kelp. Now what? All hypoallergenic dog foods have oats instead of wheat. What dry food can I buy for her? She just turned 7. I see from your 1 post that you are not a regular on this site. So a search of this site. there are tons of recipes and ideas for allergic dogs. You really shoould talk to your Vet to see if there is a food he could eat. Otherwise, cooking for him may work well. I cooked for my cairn terrier for 17 years, once a week. Once I started he never had another problem. But search the site, my recipe is still there. You'll need a grain-free, soy free food with chicken, or possibly a chicken and rice food with no other grains. And check all canidae dry products for dogs. And other Wellness dog foods. If these don't work, look at Blue, Taste of The Wild, Natural Balance, etc. My 6 year old lab Pepper is suffering from loss of appetite and terrible patches of oozing, bloody skin. I have had her to the vet 5 times. He wants 1800 dollars to allergy test Pepper. I love her very, very much, but I truly do not have that kind of money. We changed her food from Iams to Blue Buffalo about a year ago. She is currently on the duck and potato recipe. The spots come and go, but her lack of appetite and lethargic behavior just started. Any suggestions from anyone? Dod food, like most prepared human food, is full of additives. Have you tried a more natural diet of raw meat? The allergy could also be something besides food; something that comes in contact with her skin. What a tough problem. I had a dog with skin allergies that chewed himself raw. I kept changing diets until I began to cook for him. Every time I changed diets he would improve for 6 months and then begin chewing himself again. So I would change the diet again. Just as I was thinking I would have to go to the exotic meat store because I had used everything available at the local supermarket, I tried canned salmon (bones skin and all) and brown rice. The chewing stopped and never began again. He lived to be 17 years old on that diet. I cooked it every week for him. It is hard to tell if your dogs skin condition is from the diet, but it sounds like it may be. If I were you I would be thinking hard about another vet. It is much easier and cheaper to try different diets than to spend $1800 allergy testing. I would be looking for a 2nd opinion. Best of luck to you and Pepper. My English Mastiff has food allergies. What besides lamb and rice dog food can I feed him? I don't give my dog anything with corn as an ingredient. I use Blue Buffalo dry food. Seemed to help. 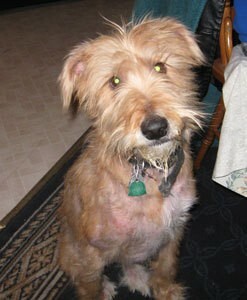 My allergic cairn terrier ate cooked brown rice with canned salmon (skin bones and all) until he was 17 years old. He was allergic to nearly everything else. I need a dog food that does not have the following items in it as my dog is extremely allergic: corn, peas, oats, lamb, salmon, or rice. I also need one that's not $100. Myself I use blue wilderness but it has peas in it but not the other things you dog is allergic too. You can get it at petsmart as well as petco. It is one of the more expensive dog foods but worth the money. Why not do a search on dog food sites and look at the different dog foods both dry and canned and pay particular attention to the ingredients. You could also prepare you own dog food this way you know what's in it and no chemical or preservatives and get doggie vitamins and put them in the food. I think you can even get raw food for them as well and give it to them that way. That is expensive so if you would do that route get the meat yourself human grade then you know what you are getting from regular stores on sale. My Shih Tzu is over 10 years old and has always been bright and full of life. Lately she is having some skin issues - hot and red on her belly and back legs. She licks and is now not feeling very well. I did change her food, but to no avail. I know she is allergic to gluten, but I also went no yeast as well. I really want to make my own food for her, but would like some guidance please. If anyone can help, please let me know! Your dog clearly needs veterinary help now as she is suffering from skin and, perhaps, other problems as well. Her problem may or may not be related to food allergies, etc., but she needs help now! My dog is allergic to beef, lamb, and diary products. Can I feed her chicken and rice, as low allergic dog food is so expensive? I am not sure that chicken and rice alone would meet all of his nutritional requirements. Please talk to your vet about the possibility of supplements. Help please, I'm in a state. My dog is allergic to lots of things and is nearly chewing her poor feet off. I have an English Bull Terrier who is a rescue dog so we don't know her history at all. Her feet and her underside are red and now her ears are going red and feel warm to the touch. I am feeding her rice and tinned dog food, but I know tinned dog food is bad. Now I have read what people have written so I have stopped the tinned junk. 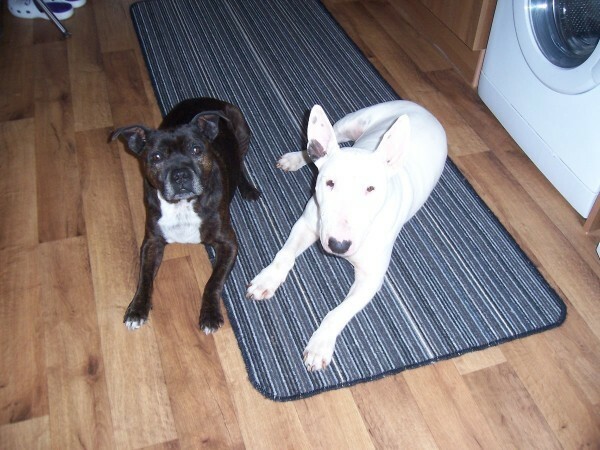 Anyway can anyone out there who has a Bullie please get in touch and let me know what to do and what to feed her? Is it OK to carry on with the rice? I don't know were to start. I am a carer for my dad 7 days a week so I struggle with my money. I also have a rescue Staffy, he is 9. He was my next door neighbor's, but the old man died so I have him cause no one would have the poor little thing. Please take the time to answer me cause I need some genuine advice. A bit late probably for your question but better late then never. I have a Bull Terrier who is very sensitive to wheat and any kind of sweet or sugar nutrients. I had him on Blue Buffalo Salmon and brown rice (red bag) mixed about 50/50 with the freeze dried SOJOS wet food. He went from bloody paws to completely clear in about a week. I also find out mine is allergic to grass. He's a very strange dog but my best friend. Can I give my dog rice and pasta if she is allergic to grains? We have also been told not to give her chicken and beef. 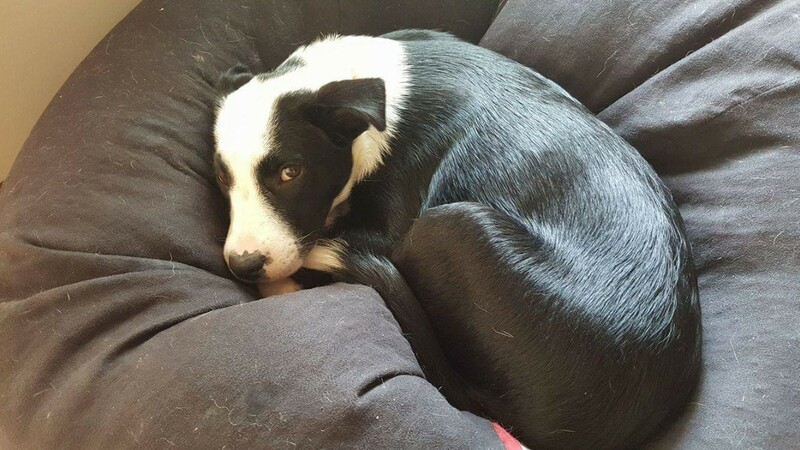 She is a Border Collie x Staffy. My Belgian Shepherd, Busta, has been suffering with major skin allergies for too long. He was diagnosed with epilepsy last year. The vet believes that the skin issues and seizures are linked, as when his rash has flared up his seizures get worse. At long last and many vets, specialists, and arguments ago I finally got an amazing skin specialist who is now doing many tests and so forth. She has requested we try a hypoallergenic food which is great, but the food she wants us to try is way too expensive so we are looking at alternatives. Any ideas would be great. I'm also looking for homemade recipes, but here is where it becomes awkward because overall the food he has tried is canned and only has meats like venison, ostrich, and other rare ones, and an unusual carb and limited vegetables. Any help, advice, or websites would be fantastic. Thank you in advance just for taking the time to read this. By Sara Benson Was B. My dog has skin allergies. The very best thing I found was Immunitol. I also have a dog with a granuloma on his paw, it cleared that up too. It costs quite a bit. I can't afford it now since I lost my job. It really works! My puppy is allergic to eggs, soy, and grain. Are there any foods you know of without these ingredients? Unfortunately many dogs develop allergies to commercial dog foods. Low ingredient foods sometimes help, but if not, pet owners often try to provide homemade food. This is a guide about recipes for a dog with allergies. I have a 6 month old Shih Tzu. He is very itchy. I have tried giving him 1/2 a benadryl 2 times a day, but it doesn't work. My vet said it could be a possible food allergy. I just switched him to Nature's Recipe Lamb and Rice puppy. Is this a good food or should I feed him something else? Maybe try California Naturals dry "little bites" Lamb and Rice dog food and a few (2-3) drops of wild Alaskan Salmon oil caps a day. I poke the capsule with the tip of a sharp knife, drop a couple drops into their food and save the rest, hole end up for the next day(s) till that's gone, then start another. That is what my vet told me to do for my Lhasa Apsos. Seems to help some. I also give them a dining spoonful of organic pumpkin with their food. 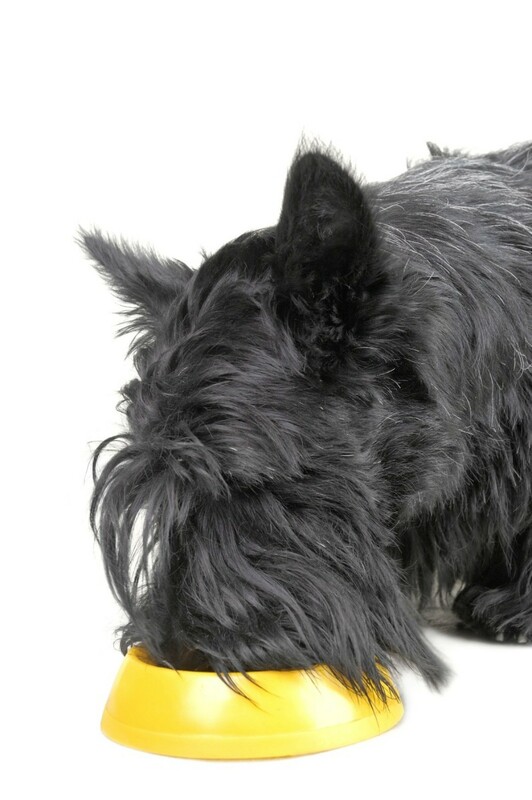 This link tells you to try different dog foods out and see what works best. I also read that oatmeal poured straight from the box into bath water relieves the itch better than oatmeal shampoo. Just soak the dog awhile in it or dip the soupy oatmeal over your dog several times. The article did not state how much oatmeal to pour into the water. Also, I read elsewhere that dog food treats and some toys can also produce allergy symptoms the same as dog food. If the dog is laying on your sheets, he might be allergic to the detergent. My little male Shih-tzu itched and itched so badly it use to completely tire him out. I started with bathing him, which did help, but never solved the problem as it kept coming back. Then I thought fleas, but you could never find any on them. However all it takes is 1 little bite to drive him crazy, I solved that with vinegar in their food and water. Yet he still scratched, was driving me crazy watching him, wondering why. If a dog scratches there is something irritating them. Finally I happened to notice his saliva glands, (hidden under those long ears) they were oft times puffy and swollen. I took him to the vet and they gave me a treatment. They said he most likely ate a spider or some little thing that didn't agree with him. A light went off in my head. How stupid of me. Slowly but surely a long list started growing. He can't eat wheat, soy, brewers yeast, corn, cinnamon, chicken or any chicken product, livers of any kind, and that's just for starters. Just this past week, he got so sick I was terrified I was going to lose him. Everyone in my household is aware and always on alert. Company that brings snacks must be monitored closely while visiting. Accidental ingestion can happen too easily. There is no such thing as buying any store food for him, not even for backup purposes. Every dog food out there so far has something in it he can't eat and I've been in touch with many holistic food companies. None can help me! So its strictly home made food for him. He does his best when he's strictly limited to raw or slightly seared, organic beef, lamb, or rabbit meat. Nothing else, he quickly becomes a little bomb around here with a buzzing tail, in every body's way, and he feels so good. For his treats I prepare special to fit him and he loves them! Another thing you may want to consider, Shih-tzu's along with many other breeds have rather long hair, and get hot easily. Could you imagine wearing a heavy coat in July and August? It would be horrid! Yet we expect our pets to be OK with it. Well truth is, they're not, and if they could speak I'm sure they would tell us so. My little Shih-tzus will get in scratching frenzies during these months if I allow their hair to grow over 1/2 inch. The scratching stops once the hair is shaved off.